Every backyard needs a deck. The best part about a deck is that it is made out of lengths of wood, so you can make it in any size or shape you like. The biggest misconception is that you need a big backyard to have a decking—this couldn’t be further from the truth. Read on, and you’ll soon see that there really is the perfect type of decking to suit just about any backyard. Ground Level: This is the most common, and the easiest and cheapest to build. Don’t mistake simplicity for lack of impact, ground level deckings can still be the star of your backyard and increase your living space. Raised Decking: Having a sloped or split-level backyard doesn’t mean you can’t enjoy a deck. The best part about a raised decking is that it opens up views of your home and the surrounding landscape. Multi-Level Decking: This decking can add more space to a backyard, while giving you the ability to devote each level to an entirely different purpose. One level could be an alfresco dining area, while another could include a pool or even a garden bed. Well, obviously you could have almost any shape you like, but the most common are round or square. A square decking is more offers a great, neat look and is cost-effective and quick to install. A round decking requires a little more labour and will cost more, but it does look incredible, especially when it’s constructed around a pond or water feature. 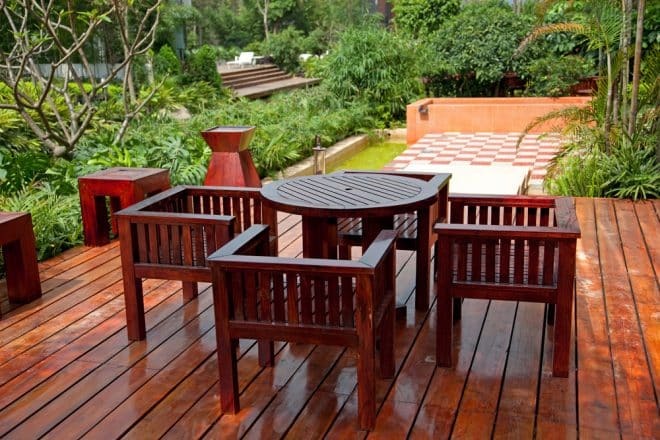 Choosing the right type of wood for your deck is maybe the hardest choice you’ll have to make. It’s all about balancing cost, with aesthetics and weighing up just how much maintenance you’re prepared to put in. Hardwoods like Jarrah, Spotted Gum, Merbau and Cumaru look amazing. They all have their own hues, grains and oils. Plus, they require very little maintenance due to the quality of the wood. They are, however, relatively expensive so you may have to sacrifice on size if you go with hardwood. Softwoods, like treated pine, are more cost-effective and with a good stain they more than hold their own when it comes to aesthetics. Softwoods are plantation timbers, meaning you don’t have to worry about taking lumber from one of our old-growth forests. Treated pine is also durable, and easy to work with which can open up your design options. Composite is becoming a popular choice for deck builders. This wood/plastic mix is exceptionally hardy and requires almost no maintenance. It is also fire, rot, termite and mildew resistant and it’s the most eco-friendly choice on the market. The planks come in a range of colours so you won’t even have to sacrifice on the look you have in mind. Lighting: Lighting makes everything better. Our eyes are naturally drawn to it, it makes your decking look high end, and you’ll also get to enjoy the space 24-hours a day. Add Heating: Nothing is better than sitting on the deck on a balmy night, but why limit your deck to only being used for three months of the year. Install some heating lamps or include an outdoor heater and create something you can use in June and January. Even better, install a shade sail and make the space weatherproof! Vegetation: Bordering your deck with planter boxes is the best way to fill your backyard with as much greenery as possible. Plants look incredible next to beautiful planks of timber, and you can continually update the contents of the planters for a decorative element that grows with you and your family. It’s time to do away with the old notions of what a deck is. You can make a deck whatever you want, and it can be made to suit any backyard. It doesn’t matter how wide, skinny, rocky, steep, flat or sandy your yard is, the right deck is out there waiting for you. You just have to find it. Of course, if you’re struggling to find the right design for you, talk to the decking experts at Everlast Services. Our expert landscapers and carpenters have built and installed decks in backyards all over Melbourne, and they’ll come up with just the right design for your needs.